The disturbances broke out just a few blocks from the funeral of Freddie Gray and then spread through parts of Baltimore in the most violent U.S. demonstrations since looting in Ferguson, Missouri, last year. Maryland Governor Larry Hogan declared a state of emergency and activated the National Guard as firefighters tried to extinguish fires set by looters and rioters with baseball bats. Gray’s death on April 19 reignited a public outcry over police treatment of African Americans that flared last year after the killings of unarmed black men in Ferguson, New York City and elsewhere. After more than an hour of mayhem, hundreds of police moved into glass-strewn streets where the worst of the violence had taken place and used pepper spray on rioters who had sacked check-cashing and liquor stores. Police and news helicopters buzzed overhead and older community leaders tried to calm down mostly young rioters and prevent clashes with the police. 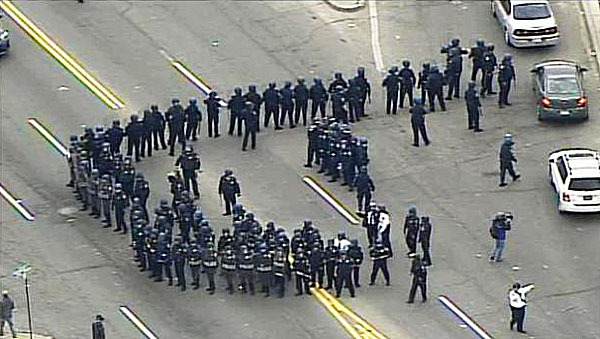 Rioters cut a fire department hose while firefighters fought a fire at a CVS pharmacy looted earlier, the Baltimore Police said. An Orioles baseball game was canceled and schools, businesses and train stations shut down in the city of 662,000 people 40 miles (64 km) from the nation’s capital. “All this had to happen, people getting tired of the police killing the young black guys for no reason. … It is a sad day but it had to happen,” said Tony Luster, 40, who is on disability and was out on the street watching the police line. Following her swearing in, Lynch signaled that improving relations between police and the communities they protect will be high on her agenda. “We can restore trust and faith both in our laws and in those of us who enforce them,” she said. At the White House, while scenes of the riots were broadcast at 5:00 p.m., Lynch briefed Obama. Print and broadcast reporters, kept out of the White House meeting, protested their exclusion. Wary of violent clashes between black youths and police, pastors and community leaders moved into the area to try to calm tensions. Gray’s family had pleaded for peaceful demonstrations. “We went in there and tore it up,” said Tyrone Jackson, 16, wearing a hoodie and a thin mustache. He said he was one of the looters inside the CVS. Baltimore Police Captain Eric Kowalczyk said at a briefing that one of the injured police officers was unresponsive and several had broken bones. The largely black city has long struggled with high crime and gangs, a reputation that has made it the setting for gritty television police dramas such as “The Wire.” Last year officials adopted one of the strictest youth curfews in the United States in an effort to tackle its crime problems. At Gray’s funeral, speaker after speaker before the crowd packing the 2,500-seat New Shiloh Baptist Church said the world was watching to see if justice would be done for Gray. Before the service, Gray’s body, clad in a white shirt, black tie and dark pants, lay in an open white coffin in front of the altar as mourners passed by. The coffin was closed during the service.